"Joyful Noise Carson Children's Choir"
"Joyful Noise photographed at Shepherd of the Sierra Lutheran Church, Nov. 30, 2018" . Joyful Noise Carson Children's Choir became an affiliate of the Carson City Symphony Association in fall 2017. This choir gives children the opportunity to develop their voices and learn music concepts of rhythm, pitch, expression, and performance in a small group. The Joyful Noise choir sings a variety of tunes - hymns, folk songs, and silly, playful pieces. No musical background is required, and all children are welcome to participate. Choir members learn musicality and performance skills through the joy of singing with a choir. For kids ages 4 through 12 in Carson City, Carson Valley areas. Click here to see article in CarsonNow.org concerning Joyful Noise Carson Children's Choir beginning spring 2019 session. 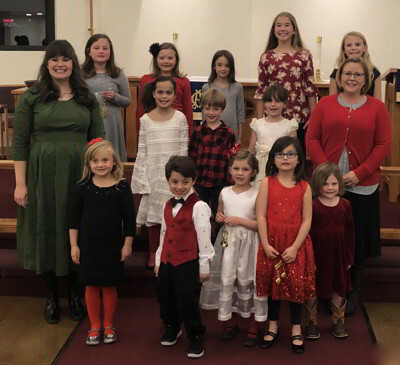 Fri., Nov. 30, 2018 - Joyful Noise Carson Children's Choir performs at 6:30 p.m. at Shepherd of the Sierra Lutheran Church in Carson City (near Best Buy, south of Topsy Lane). Sat. Dec. 1, 2018 - Joyful Noise Carson Children's Choir performs from 2:00 to 3:00 p.m. at the Nevada Artists Association Gallery in the Brewery Arts Center Building, 449 W. King St., Carson City. Thurs., Dec. 16, 2018 - The Joyful Noise Carson Children's Choir perform at 7:00 p.m. at the Carson City Seventh Day Adventist Church & Food Pantry, 405 College Parkway, Carson City, NV. Sat., April 21, 2018 - Consort Canzona Early Music Instrumental Ensemble and Joyful Noise Carson Children's Choir present a joint concert at Shepherd of the Sierra Lutheran Church, 3680 Highway 395. Find us on Facebook at https://www.facebook.com/Joyfulnoisekidschoir. I asked my parents if I could learn to play the piano when I was four-years-old. My first piano teacher lived just up the street from our house, so I got to walk to her home for my lessons. I am grateful to my parents for proviting piano, voice, and viola lessons over the years and for opportunities to perform at church and community events. In middle school, I learned to play the viola and continued playing in orchestra at the Las Vegas Academy of International Studies, Performing and Visual Arts. In my junior year of high school, I became a vocal performance major and loved participating in regional and state choirs and orchestras. 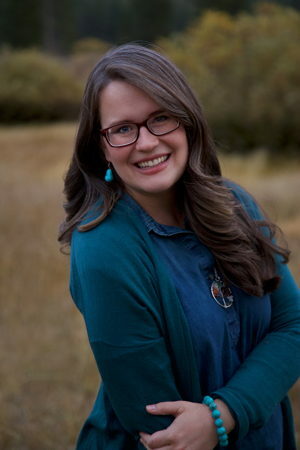 I attended Brigham Young University, and though my major was English, I made sure my electives were studded with music courses: music history, conducting, organ, and my favorite, Women's Chorus, one of only four auditioned choirs at the university. I performed in Women's Chorus as a second soprano for three years. As a mom, I have loved singing with my little daughters and playing at mommy-and-me music classes. I teach private voice lessons, and perform with the Carson Chamber Singers. I think making music helps children with their emotional stability by giving comfort when they are uneasy and letting them express their joy in life and gratitude to God. On a practical level, singing songs aids our family with transitions and routines, memorizing facts, and getting our work done - plus, it's fun. I hope you will join us for this exciting new children's choir. For further information, check the Spring 2018 registration form. It is available by clicking here. Carson City Symphony's youth programs are funded in part by grants from the Nevada Arts Council and the National Endowment for the Arts, and private donations.